You wouldn’t hire just anyone to clean your house. Similarly, if you’ve decided to contract out cleaning and janitorial services at your office, it’s important to thoroughly review your options. A cursory search online will unearth numerous cleaning companies in your community. Which one you choose will depend on a variety of factors, including your own personal preferences, cost and the cleaning needs of your workspace. To help narrow down the field, Goldstar has compiled this handy list of questions to ask yourself when comparing the services of different cleaning companies. How frequently do you need cleaning done? Your answer will depend on numerous factors, including the nature of your business, the number of employees and what facilities (kitchen? bathrooms?) are present in the office. What do you need cleaned – and what can you handle yourself? Most cleaning companies provide a checklist of services they can perform. Once you’ve hammered down a routine that works for your office, make it clear to your employees that personal cleanliness is still their responsibility. Who are your cleaning company’s references? Don’t settle for online testimonials. 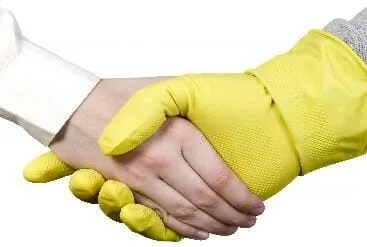 Ask to speak with references from other companies that hired your cleaning service. Ask your references what the cleaners do well, what they can do better and whether they’re satisfied with the quality and cost of service. Do you have special cleaning requests? If you have cleaning requests that go above and beyond what’s on a cleaning company’s checklist, ask whether they will accommodate you and request a quote for the extra work. Training, health and safety laws and insurance may inhibit some companies from performing non-standard cleaning jobs, so be realistic in your expectations. Is green cleaning important to you? Some cleaning companies specialize in using products that are hypoallergenic, biodegradable and low in volatile organic compounds (VOCs). However, these eco-friendly plans will likely be costlier than normal service.